Thank you registering a free skills gap report. We will contact you in 2 weeks. View sample report from here . Your FREE report will be sent to you in July 2015 if there is enough samples collected. So please recommend this page to as many friends as possible. What are high demand skills for Big Data Engineers with Salary 120k+ in Melbourne? There is a frequent asked question about what are high demand skills for Big Data Engineers in Melbourne. I decide to dig into with some job boards data. Here is my find. Problem solving is ranking top 1 skill required for big data jobs. I guess that is because purpose of data is to understand problems and solve problems. As limited time in hand, I will stop updating this one. The primary contribution is that they are extending the definition of waste to fit in the software intensive product development context. Read your the article here. An article is worth reading if you believe agile software is all about quick turnaround. Stop telling your employee what to do, read the Harvard Business Review article here. Learn how google prototype and build google glasses from this video. The Social Age sees us connecting, sharing, working and leading in online spaces. But it’s a mistake to think that the real change is in the technology. It’s not: it’s about the sociology. When you build distributed agile team, always remember social and collaboration first. Here Luis Goncalves explain several Agile AntiPatterns that many companies face and struggle with. In this specific post Luis Goncalves is tackling Agile Retrospectives AntiPatterns. As gender gap in IT industry becomes more known problem, Agile Coaching group in Melbourne get together and talks about the issue. There are many insights that I have gain. The article summarizes three top learnings in the meetup. How much time does it take between collecting data and taking meaningful action? Is that in 1 min, 10 mins, or 1 hour or 1 month? The article give you some technical insight about how to achieve real time analytics. Though the use of big data remains a huge challenge for many businesses, those with more advanced capabilities are beginning to shift the emphasis from volume of data to speed of analytics. Do Pivots Matter? Yes, in Almost Every Case. 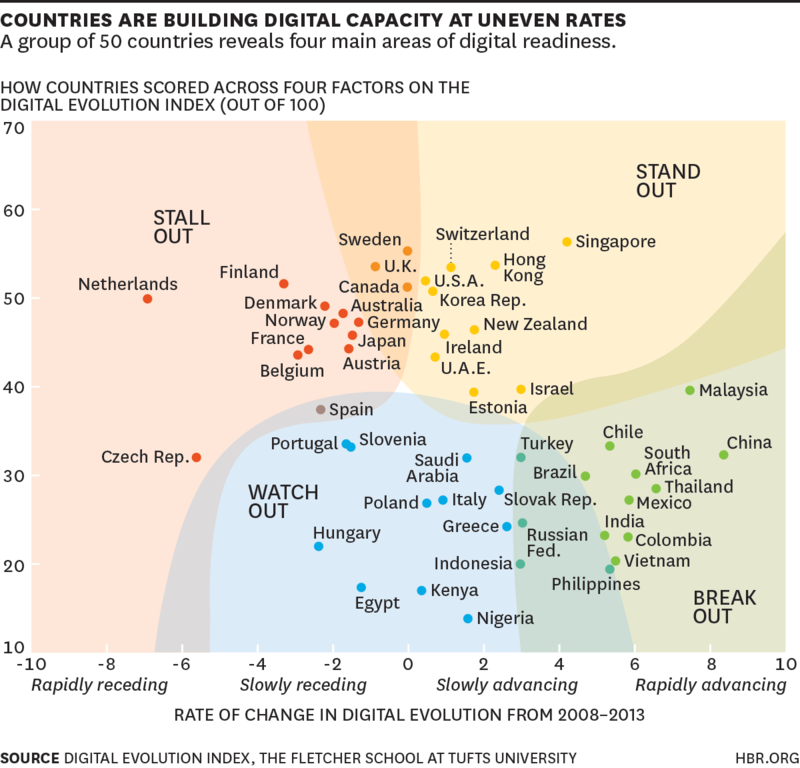 The Harvard Business Review article summarize where digital economy heads today. Where is your country heading? Read the HBR article here. Yann Girard have been observing the entire crowdfunding space for a couple of weeks now. There were a couple of very interesting things he found out. Most of these findings made him rethink the entire crowdfunding game and how to best use it. It especially made him wonder about its effectiveness for very early stage projects with limited to no financial resources at all. Read his article here. The articles highlight the difference between a good pitch and an average one can see your startup either getting much-needed venture capital or the cold shoulder from investors. Read the article here. Will Middle East become next biggest startup ground? When 33-year old Kuwaiti entrepreneur Abdulaziz Al Loughani first glimpsed an opportunity in local food delivery company Talabat in 2005, nobody believed in him. At the time, only 23% of Kuwait’s population—a mere 600,000 people—were using the internet. The few startups that had launched, including his own, were off to a rocky start. Read full article about what it is like now in Middle east here. The success rate of a startup is below 5%. Don’t let your business end as just another sad statistic. Avoid these common start up mistakes and join the ranks of winners. Know the 7 devastating startup mistakes before it is too late by clicking here. It is an excellent article from @amritachandra . Lots of my followers have favored and retweeted it. The most engaged startup and entrepreneur tweet for this week. Read it now and see what can work for you. View the slides here. Everyone has great ideas. But it is hard to decide whether we should start a business or whether it is right time for that. The mindmap give you lots of help in that. From that, you will understand what you need may need to become entrepreneur. Check it out now. @sujanpatel and @RobWormley have created a great toolbox for growth hacking ideas. Before scaling up, you need to brainstorm what can be done. The book will give your ideas that you may never thought of. I downloaded the trials version, it has been very helpful for first timer as me. Download preview or the book from here. These days as an entrepreneur there is no such thing as payday. There are no weekends or month-end either. There are just days. There are days when you have lots of money. There are days when you have a little money. There are days when you are broke. But there are just days. Read the article here. Why Are More Small Businesses Turning To HR Tech? 10 Things You Should Know About Performance Management; First one is Performance management is making sure that strategic priorities are aligned with resources. Accomplish Great Things at Any Age, Here are 41 reasons to get out there and make it happen, no matter how young or old you are. 6 Hallmarks of High Performing Teams, Great Teams Exhilarate — What Sets Them Apart? The future of work: Say goodbye to HR? Why Performance Management needs to be disrupted. Pronto. Consistently update the #performancemanagement system to meet the needs of the organization and the employees. What Are Performance Reviews Really About? #Training is rarely the best or most economical way to address performance issues. Mike Guerena participated in a panel discussion at CES 2015 on Mobile Learning at the Transforming EDU event. In addition to Mike the following also participated. SoMe CEO becomes high demands come from deep desire to understand customer and promote brand. Read this Harvard Business Review article for more attributes. A great and tell you a brutal truth about why people failed their passion and career. It is one of best TED talk you an watch. Watch the TED talk here. Jeff Haden is one of my most respected influencer about leadership. This is one of excellent article from him again. Read the article and build your habits now. In today’s world, LinkedIn has becomes most of important part of your personal branding and one of most important channel prompting yourself. The tips in article are very helpful and practical, click and read it now. A Deep Statistical View of #DeepLearning: What is Deep? How is Big Data Changing the World? How mature is your org’s #DataScience capability? Which #BI Business Intelligence tools are companies investing in? #DataLiteracy = #DataScience For The Masses! Start small. Think big. 11 #IoT Programming Languages Worth Knowing, what are they? The article highlights three reasons that big data project may fail. Check your big data project and see where it is at. Watch the video here why we need storytelling. This week is about use cases for big data in different industries including energy, utilities, insurance, healthcare and others. And real time data analytic is being pushed by different big data technology providers and there are demands from big players to fully utilize their data potential. This video from IBM emphasizes the serious implications that bid data applications could have on the future of energy. Interview with Ajay Bhargava who has more than 25 years of industry, research, strategic consulting, and teaching experience in the areas relating to databases, enterprise data management, data warehousing, business intelligence, advanced analytics, and Big Data. He has also contributed to SQL, ODBC and IDAPI database standards. Ajay built, and heads up the Global Analytics & Big Data practice for TCS Insurance & Healthcare customers. Our prehistoric ancestors spent much of their waking hours foraging for and consuming food, an instinct that obviously paid off. Today this instinct is no less powerful, but for billions of us it’s satisfied in the minutes it takes to swing by the store and pop a meal in the microwave. I started product discovery journey for KareerTracker from June last year. There were lots interests from busy parents who have ambitions to grow their careers while having more time with family. We believed that there were more demanding from women because they have more difficulties in managing time and keeping focus from interviews. But the January usage stats told us a different story and the ratio between mums and dads was 2:8 and dads are much more active than mums too. To search for cause of the problem, I attended an excellent session, “Women in Agile”, by @StephBySouth which attendees talked about gender gap in Agile community at Melbourne. A girl just graduated went into a high performance agile team. The team members have great relationships, they drinked together, they even have retrospective in someone’s house. They have great geek culture. The girl found it was difficulty fitting in and left the company after just two months. 90% of problem raised in meetup is related to culture. In Keira Snyder’s research, 65% of women leaving IT industry and not looking come back to IT becauses of maternity leave and social responsibilities such as taking care of kids. There are lots of women leaving IT because of social responsibilities like taking care of kids. From discussion, the flexibility of working hours becomes one of the biggest impediments for women. And in the same time, most women worked in highly collaborative roles like Iteration Manager, Product Manager and other roles which requires highly effective collaborative skills. It is very difficult for them to have different working times because of nature of jobs. There is no clear solution for the problem. We need to solve this problem. Otherwise, we will have leaking pipe and there will be never enough women in IT. Women and men are genetically different and they were brought up differently. To increase number of women working in Agile and IT, we need to respect differences. There are lots of women working as testers, iteration managers, UX/UI, and product managers. But we see trends that there are actions to try to increase ratio of women in STEM (Science, Technology, Engineering and Mathematics) . But is that what we should do? There are many skills that we need for IT industry. Support, respect and think benefits of one’s skills to team is a starting point. Article from Rachel Sklar, “Stop Equating Women in Tech with Engineers”, is a very nice reading about Stop Equating Women in Tech with Engineers. It is time to setup new annual goals. I have started to setup annual goal since 6 years ago. I had difficulties in reach goals and feel depressed around December every year because I haven’t been able to finish them. It was in chaos mode for December, preparing for holiday, summarize what has happened and plan out other bold annual goals. Last year, I have found the “S.M.A.R.T” rule for setting up goal. It has helped me a lot in achieving goals. And I did some changes in how I discover my goals too. I want to share my learning and feedback are welcomed. I often found my list full of career development achievement. Several of my friend did the same thing. Except the ambitious part, another biggest roadblock with list was unbalanced list. My goals didn’t include other parts of my life like personal health, family and community, my life was unbalanced for sure. I was workaholics. I were not happy and didn’t achieve what I want, and there were no big improvement in job satisfaction too. I started realized that I am in unbalanced life around December 2014. Now I am running a part time business help people’s career development. And I am able to drop business related stuff in hand and spend time with my child any time. And I am much healthier than before. SMART rule brings structure and track-ability to your goals. The clear and quantifiable SMART goal will make people focus and easily setup milestones for your 12 months ahead. With SMART rule, you can evaluate your objectives. What are the conditions and limitations? Why exactly do I want to reach this goal? What are possible alternative ways of achieving the same? Measurable is the most important part of a goal. Without it, you will achieve nothing and won’t feel satisfied even when you hit something big. And it helps you thinking more detail about your goal. I want to be happier. But happier can’t be one of your new year resolution. It is not measurable and not evidence. Using health as example, I were thinking that I must live in a healthier lifestyle. It will be very hard to achieve it if you don’t measurable goal. You will notice, all of them are measurable and I have setup expire date too. And I have been using Runkeeper to track my goals and using medical check every six months to check how far away from the goals 2&3. I made some very bold goals between 2010 and 2012. I did make one of two of them. But I do feel depressed every December when new year was coming. I feel happier and more achievement to setup reasonable goals while considering my commitment to family, community and health. Don’t think that you gona have 80% commitment to your career goals. And you are a new mum. Please setup as less goals as possible. Just enjoy time with your kids. Knowing your focus and what are other commitments will help you reasonable goals. If you setup goals related to workplace, you need to understand cost, your supporters, business benefits and more. You goals should be relevant to missions that you and your family setup. The more relevant and more you are passion about, the more chance that you gona work harder and get it done. Annual goal is time-bound, 12 months. I personally found that starting a goal from February is much easier and achievable than starting from January. In the same time, setting up milestones for your annual goals will increase your awareness towards goal and make yourself learning more from the journey. Setting up milestones for your goals and review them are very important. There are several tools existing tracking progress toward goals. Please see last part the article, you will find mobile apps that I have been using.